Knowing how to use boating knots is a valuable and much needed skill, both on and off the water. Knowing how to tie them makes water sports at campgrounds and elsewhere safer for everyone at a lake or river. You will find there are boaters on the water at all times of the day and night. These knotting skills are necessary for fishing as well as pleasure boating. Tying boats to the dock is a skill that needs to be practiced. Tying the right type of knot will keep your boat from floating off and your skier above the water. You don't want your boat coming untied during a fun moment. That could easily turn into a dangerous situation. Boating or sailing knots are actually a very popular skill to practice, especially in the summer months. 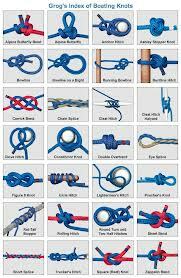 Boy Scouts have courses for learning all the different knots you can tie and their various purposes. It is fun just to sit around along the bank of the water and watch the boats fly by while practicing your knot tying skills. The shapes and sizes will astound you. Did you know some people actually live on them? Yes, they do!! Some folks even build their own boat. When docking your boat, especially when you live on it, it is necessary to tie it right so it won't float away. Good strong knots are essential to keep it docked when you need to get on and off. Knowing how to untie these knots is important, too, so you aren't stuck when you want to be on the water. Boats come in many different styles and uses. You have ones for fishing, one for speeding, one for skiing, one for living in and one for touring. You will likely see any of these at any time during your stay at the campgrounds, but boating knots are all the same. Learning to tie boating knots is a must have course if you plan to dock a boat or pull a skier. You're bound to lose either of them if you don't do it right the first time. There may not be a second chance to get it right. Watching it is enough for me. It is interesting to watch beginners learning to ski. If you sit and watch, you will laugh at times. Then you will want to cry. Finally you clap and cheer for them. You can almost feel the determination in the air as these beginners learn to ski. Practice is the key to perfecting it. If you are already a skiier, you are the ones we campers enjoy watching. Just remember to have fun and be safe! If you are interested in learning to tie boating knots, just get your rope and join the rest of the boaters. There are different kinds of rope to practice with. Be sure to use the correct rope when actually using it for an intended purpose. Not all ropes are the same.